Sunset Series will see beautiful Princes Park brought to life at Race 2. 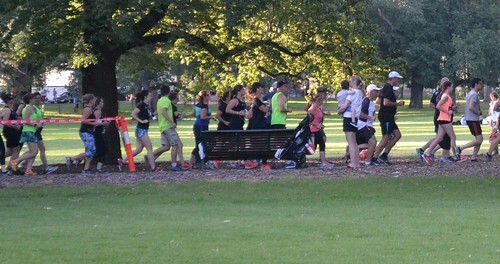 Continuing your fitness journey from Race 1 at The Zoo, Princes Park is transformed as dusk into a Summer Sunset festival complete with party lights, live music and fantastic food from Melbourne’s favourite food trucks and a Sunset Bar. Bring a picnic rug and make a night of it with your friends before the Summer ends. I had initially planned to run this one at the sedate 6 min/km pacing as pace training. Given the conditions I felt like I needed a “bit of a run”, so I ran with Liam for some 4:30 to 5:00 min/km pace. The good news is that this pace didn’t cause any issue, no sore spots, able to talk the whole way, and no impact after finishing as I was able to wander off and catch up with those still running – this is promising. 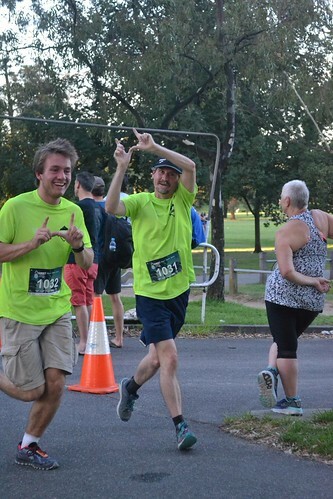 We did start at the back of the final running wave for the 8km so there was plenty of weaving, but the Princes Park course allows for the passing and it did not feel congested. This year was slower than 2016 by about 2 minutes, but as I wasn’t aiming for a speedy run that shows we were still moving pretty well (probably a PB at this distance for Liam). Next up in this series is R3 at the Tan in a fortnight … this will be after Roller Coaster so it will be interesting to see how I go.